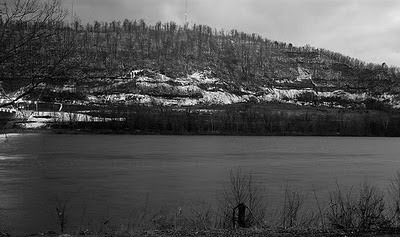 The picture above is of South Shore, Ky, a viewpoint from the shore of the Ohio River in Portsmouth, Oh. This is just west of Shawnee State University. Why am I showing this picture? Well, yesterday, I had a great amount of fun over on those hills. Since the sleet and wind was proving to be a hassle in the city, I decided to break away from the team and head into the protection of tree's. I am glad I did so, because the wind was so much less intense. I had run over in Kentucky many times, always climbing up Firework Hill to get to the trails (which are all 4-wheeler paths), and have had some good runs. I have also had one distinct bad run, around this time last year; I was attacked and bitten by a mean-hungry-big-fierce-looking pit-bull. My wound has healed and so has my forbearance of Kentucky. This time running in Kentucky, I did not take Firework Hill, but instead followed the highway in search for another way to the top of "Microwave Ridge." I think the reason this is called "Microwave Ridge" is because of the unusual high amount of phone, radio, television, etc. towers on the ridge and the radiation they emit is at a pretty high level. After saying that, I am wondering if I should even be running over there! Anyways, I figured there were other ways up there down the road. So, I turned onto this small paved road and it ended up coming to a dead-end in a big open field past a junkyard. There were hills surrounding me so I ran along the bottom and found a trail. This was the start of a huge climb. I named the hill "Sperry Hill" (that was the name of the junkyard) and it deserved to be named! Once I got to the top, there were many different trails that went in all directions. I followed the main on for a while and turned around and finished a nice 2+ hour run. It was nice to get onto some fresh soil and discover new places to run. All of this time, it was only a little ways across the river! This week has been a successful week. My main goal was to not race this weekend. After asking Erock if that was ok, he seemed cool with it and that gave me the chance to really focus on improving my fitness, to a new level for my body. My plan was simple, run a lot! Last week I topped out at 95 miles and I knew if there were no distractions, 100 miles would not only be the mark, but possibly over 100 miles. So far, it is all looking good. There have been no "two-a-days", so it is just one run a day. Some people get there fitness by running a lot of workouts, but I look to get fitness by doing all my runs at once. Later, I am sure it will be important to do some doubles, but for now running once a day will improve fitness like no other. Yesterday I had full intentions of just running 12 miles or so. The team meets at 4:00 so I arrived a little early to run 4 miles, since we were going to be doing 8 miles starting at 4:00. I felt really good on the run, as I was able to listen to 56 minutes of the "Great Debate" between Paul and Reece, time went by quickly. As we were finishing at the school, Eric, a recruit Brad Liston, and his dad were just beginning their run. I decided to turn around with them to chat. 50 minutes later I was still running with them and crossing the 2 hour, 10 minute range. So, a 12 mile day ended up turning into a 19 mile day (on concrete sadly). All in all, it felt great! We all headed to Pizza Hut afterwards where I was able to eat as much as I wanted, which helped the recovery a lot. The past 7 days, I entered into new levels of running. This new week, starting Monday, I have ran two 2 hr runs and 4 consecutive 15+ mile runs. That puts me at 112 miles for the past 7 days! My body feels great and I am ready to experience new levels of running and test my body again. These next three days of running will be a lot easier then the previous four, but who knows, maybe today's 11 mile run will turn into 18! This past week has been great. Reece and I have enjoyed great meals at the house and many great runs have been ran. Tuesday was the teams first "workout." We did 4 x 1 mile on the Bear Run and I was pretty pleased with the outcome. With the mileage I have been running, there was no way my legs or lungs were going to get tired! Wednesday quite possibly could have been the best run of my life. Reece and I drove to Chillicothe to start the Wednesday Trail Tradition runs in Chillicothe. 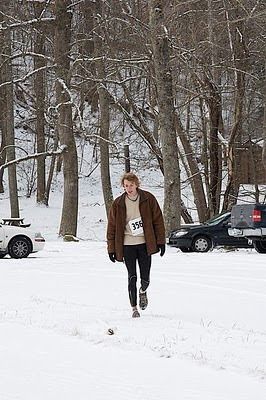 We met up with Keegan Rathkamp and his dog Suka to run at Great Seal. I have heard so many great things about Great Seal and practically know all the names like Sugarloaf, Bunker Hill, Mt. Ives, and so on, just from reading Keegan's Blog (see "Who I Read" for Keegan's Blog). So, it was nice to finally get to run on them! We did two hours out there, in the dark, with our headlamps. It was a blast talking about all the great memories we all have had together. Suka ran 50 minutes with us with his headlamps on as well. I have never saw a dog run like that! It was such a chill run, with fast downhills, slick uphills, and fresh track making trail running! I can't think of a better way to spend a Wednesday evening. After the run us three and Keegan's wife Cara went to Jerry's Pizza, a famous eatery in Chillicothe where I enjoyed an entire pizza! Yesterday was also a good day of running. We had an indoor meet at Cedarville and I was anxious to see how my body was going to react. I felt like I recovered really well from the 2 hour run and that my body was rejuvenated, so I was ready! I was the high seed in the 5k, but Ron Duncan, a 24:20 8ker was also in the race. I lead the first two laps to get things started and Ron passed me. I set on him like a dog on a bone for the next two miles. This was setting up perfect for me. This is not to mention that Shane Meyer was right behind me as well. After I sensed our pace was slowing I put on one of the biggest surges in my life and put a 5 second gap on the field. There was no looking back from there. I won by 8 seconds and felt good doing it. My legs never burned too bad and I never gasped for air. It was a good tactical race, plus I PR's with a 15:27. Reece Brown had the best day of all though. He PR'd in the 1 Mile, 4:48, and the 5k, 17:09. Shane also PR'd with a 15:42. A great day for all the Bears! I woke up this morning feeling like I didn't even race yesterday. I now know how much mileage pays off and helps recovery. If I was only doing 50 miles, my legs would be aching and I would not of did the morning run that I did. 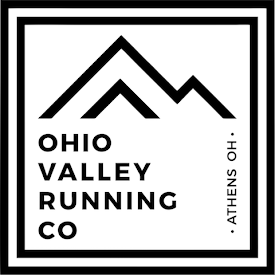 I cannot wait for the nest adventure that will come and the many more Chillicothe Wednesday Trail Run. Life is good, and I am feeling good! In my Mind I was a Child, and it Felt Good! This entire week of running has been great; I have been running snowy trails, slipping and sliding down slick hills, more or less skiing down them! My previous three runs have included this type of running, all with Reece, on the trails close to his house. He brought up a great point during one of the runs......... Everyone remembers playing in the snow as a child, but no one ever does it when they get older. 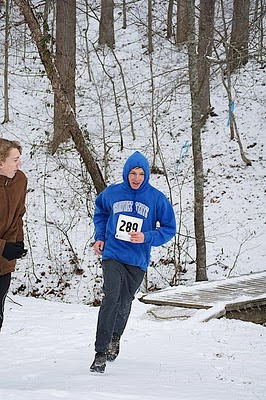 For me, and all the other dedicated runners, especially people that run trails, even with snow, we do not have to remember "the good ole days." Our good day was today, or yesterday, or.... tomorrow. That is just one satisfying thing about being a runner. I might not be sleigh riding down a huge hill, but I am sliding down it at a pretty fast speed, on my feet! It is so much fun. No longer is it, "it used to be so much fun." It is a very good feeling to know that the majority of people my age sit at home and do nothing when there is snow on the ground, and I am outside having a great time, with cool people. This brings me to another point about running, we can do it for a very long time! There are more people running ultras that are above 50 years old than not. It is crazy to hear Reece talk about a guy that said he was "Kamikaze" running as he passed him down the hill, and he was old! This guy probably had double the foot skill as me going down a steep hill at top speed. I will be playing in the snow for a very long time! I also have had other great conversations with Reece during these runs. We have discussed how it is great to use our legs! Not everyone has the ability to walk, run, or do the things we do. We shouldn't just sit around and feel sorry for these people, even though it is sad to see a young person in wheelchair. They do not want us to stop using our legs! So, why not use them as much as we can!? That was only a couple discussions that Reece and I have had. I am really glad to be living out at his place. Whether we are fixing good food, running great trails, or jamming on the bongo's, it has been all been a blast. Last Saturday was one of the funnest races I have ever run. 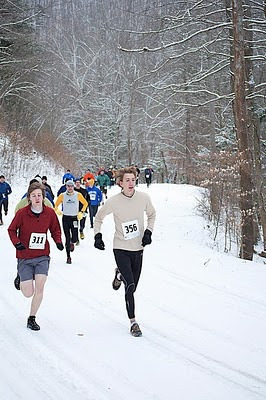 Friday, Reece and I left Pinehurst and headed to Charleston WV to run the Frozen Sasquatch 25k in the morning. The original plan was to run a race in North Carolina, but it was a longer drive and this race sounded like a lot of fun, and that it was. We woke up to a lot of snow on the ground and sub 20 degree weather. Knowing that, the trail that the race was on was completely covered which made for slick uphills, downhills, and overall slow times. We arrived at the course fashionably late, at 7:40. The race started at 8:00. I would like to give a big thanks to Mike Dolin, the race directer and forester at Kanawha State Park. He got Reece and I into the race about a week before the race, after registration was closed and welcomed us warmly. He did a great job organizing this thing. Without much warming up, the race started and soon entered into the first trail. I heard word that the first mile was a huge uphill climb, I was ready! A kid was right behind me until about 3/4 of the way up the hill, but I think he started to walk because I did not see anyone after that, except for a guy that was running the 50k. He (Eric Grossman, ended up winning the 50k) passed me while I went the wrong direction after the first aid station. I felt like I needed to stop since I didn't have time for breakfast (only a pear) and drank little water before. Shortly after though it was just me and the fresh snow. It was now time to relax and have some fun! Even though I went the wrong direction, the course was easy to follow, with blue ribbons hanging from tree's. I not only went the wrong direction after that aid station, I managed to go the wrong direction about a mile before that first aid station as the trail switched. I shortly realized it after about 30 seconds of non-marked trail though. Those were a small mistake that will not happen next time. I felt relatively well throughout the race. There were 3 other good size climbs after the first one. At some spots, power walking was a faster alternative since the snow was making it slick to run. The downhills had to be taken slow as well, or else I would of bee on my back, with a cold body. So, I took it easy in some parts and hard in the places that I could. I wanted to break 2 hours and during the last 5 miles or so I was pushing pretty hard. I ended up running 2:07:25. The next finisher in the 25k was 12 minutes behind and Reece was 15 minutes behind. The closest guys to me were actually 50k runners. They ran great, 4hrs and 30'smin. It was a great feeling being in the lead for a long time like that. Especially when I was making fresh tracks in the snow. Everyone else was following my footprints! Time went by fast, it always does when you are enjoying yourself! After the race, I was given my awards. Every entrant got a Patagonia long sleeve shirt, which was awesome, and a carved piece of white cedar with the race logo on it. For finishing first, I received a painting of a runner and a golden ticket for a free entry to next years race. Great things to have. There were also a ton of food, soup, sandwiches, cookies, hot tea, hot chocolate, etc, etc...... Reece and I met some cool guys and had a fantastic time. It was a great way to start a new year! This morning, I once again strapped on my backpack and pedaled to school. The first day of fall semester I am sure I was doing this same thing, except in 80 degree weather with shorts on. Today, there was a fresh dusting of snow on the roads with a sub 20 degree chilled air. I was bundled up quite well for the weather. Riding to school in this type of weather is always fun for me. Even though I only life a half a mile from the school, I still get weird looks when I ride into campus, like "why is this kid riding his bike in 15 degree weather!?" But, it beats walking for 10 minutes and wasting gas for a short drive! Now that the new semester has started, it is time to evaluate my goals from last semester and to create some new ones for this upcoming season and semester. I will list briefly talk about my previous goals from fall first. Thankfully for me and a few other guys, Keegan talked to Erock two years ago about going to run trails every Wednesday. So, it was my goal to continue that trend. We did it pretty well. very Wednesday, Corey, Shane, and myself made the trek to the forest and ran trails. Coupling that with a post run milkshake made for great Wednesdays. This concept too was inspired by Keegan Rathkamp. Two years ago, a few of us would go out there every Sunday night and get a long run in, many times finishing our two hour run past dark. Many people contribute much of their success to this. This year, not only a few of us ran every week there, the majority of the team did. It was actually a team goal to do this. Some of my favorite runs were at Hangover, sucking down a PowerGel halfway through a 20 mile run in late August and early September, and simply enjoying a beautiful early Sunday morning. Great times and great strength through this goal. This was a simple goal to achieve, all I had to do was study and work hard as I did the previous semesters and simply get the grades. I ended the year with 5 A's and one B. Not a bad year. This is a goal I have always had. I believe achieving the first 4 goals will lead to this, along with other factors. I enjoyed last semester and the season greatly. I became close to a lot of friends and made a ton of memories. Now it is time to do it again. This has been something I wanted to compete in for a couple years now. Due to track and cross country it is hard to though. But this year, I am going to do it! 7 of the 12 races are needed and I think I can fit them in. I need trails! I want to expand on the Wednesday trail runs and run them a lot more. The weekends will be spent on trail along with Wednesday and another week. Also, now that I have a headlamp, early morning or late night trail runs are now possible. Although I am not the biggest fan of track season, I want to enjoy it. I guess there is still somewhat of a thrill instilled in me of running fast around a track. I want some fast times in the 5k and 10k as this could be my last season of track! Running 100 miles was not a goal for me last Fall, it just kind of happened. Now, it is a number I look at, that I want to achieve and have aim to do it. I want to be at this level for a long time and see how many I can get up to. 115 sounds like a good number. This on should be easy. This will be a great semester and great running season. I cannot wait! So, there it is, my new goals. More good news to share as well! Reece Brown asked me to move in with him this semester. I have worked out a deal with the Hornick's and I am out by the end of the month. It will be great to live out at Reece's. I love it out there and it will be amazing to get away from the city every night. Great times sure to follow! Welcome to 2010 from North Carolina! This past week has been outstanding. The Monday after Christmas I headed down to North Carolina to chill with my good friend Reece Brown. I had planned on doing this for a long time, but finally decided to do it Sunday. No one went with me, so it was a solo drive down to Pinehurst. I woke up early Monday and ran 5 miles before I left. When I got there, me and Reece ran another 50 some minutes. We met up with a couple boys Reece met the day before, Will and Dillon. It was a good run. That night, Reece and I went to dinner at the Ironwood with a guy names Tag Leon. He is a golf pro at Talamore, the golf course Reece used to work at. He is a very cool guy. The restaurant was great, a common theme to the week. Tuesday, we ran a couple times and helped Tag out laying hardwood floor. This was the first time I had did this type of job, and even though it was hard work, it was fun doing it with a couple cool people. Reece and I also purchased running headlamps at an amazing store called River Jacks. This is just one amazing store in downtown Southern Pines. But, the headlamps are the top of the line, Black Diamond brand, just out a couple weeks ago. This will add a whole new dimension of running for us! We used them several times throughout this week. Wednesday was another work day at Tags. We made some good progress on the floor and it felt nice to help out, since Tag treated us to dinner twice and a free round of golf at Talamore. We ate at a place called The Green Room. Thursday was our golf day. It was cool getting VIP treatment since Reece knew everyone that worked there and Tag was the pro. Our round of golf wasn't very good but we had a memorable time on a great golf course. Thursday night, we went to dinner at a place called Mister P's with Reece's family. After that we went to a little New Years get together at Reece's friends house. There was a lot of ping pong played! At near 2 am, me and Reece welcomed the new year with a night run with our headlamps! It was fantastic. Today is Friday, I woke up and ran while Reece did some work at Talamore. We are leaving here soon to head to Charleston, WV. 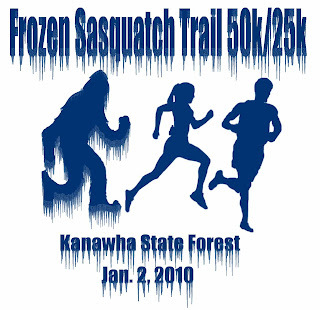 We are racing the Frozen Sasquatch 25k in the morning. I cannot wait for this race! I have ran a ton of miles this week and the week before and am ready to run a nice trail race with a lot of cool people. There were a lot of great memories on this trip. This place is really cool, especially downtown Southern Pines, and there are a ton of golf courses and nice restaurants. Every night we would do a night run with our headlamps. Most of these runs were around the reservoir. We stopped out on a little deck at a point by the lake and just chilled. It was very surreal there at night. I can't wait for the race tomorrow and the new year to come. This semester will be great!